17 square meters aims to be an open and free residency welcoming all poets, whatever their background and level of experience. To prevent abuse of the generous but limited facilities, the residency will not be advertised publicly but aims to make itself known through word of mouth. There is no application form and no deadline. No artist likes either. To apply, simply send an email to paris@trelexresidency.com with your proposed dates, once you have checked for availability here. Please let us know how you have heard about the residency. If several people apply for the same period within a short time, we will give priority to those who can stay the longest and to those who are coming specifically for an exchange or collaboration with other artists in Paris. Otherwise, places are allocated strictly on a first come first served basis. The residency is very cosy and small and is only suitable for one person. We ask that you make the most of your stay by focussing on your practice. 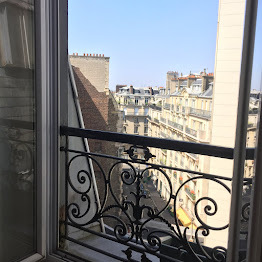 If you wish to share your experience of Paris with a friend or partner, we ask that you keep the residency space for your work and book a bed and breakfast or hotel to share during the visit. The only exception to this rule is that the poet may bring a child with them if they need to. The studio is not childproofed in any way or particularly suitable but we go out of our way to make Trelex Residencies accessible to artist-parents. We generally prefer people to come for a minimum of a month. This is because we cannot ask those who will welcome you to be available for new artists every couple of weeks, for example. This said, if you are coming to Paris for a reading or an exchange you have arranged yourself, we may consider a request for a shorter stay. Though we will be reluctant to book someone in for a week in the middle of a longer free period. You are welcome to come for up to three months, either in one go or over repeat visits. Please note your place is not reserved until you have booked return tickets to Paris. The earlier you do this, the cheaper your trip will be and the better we can plan the residency. You will also need personal liability insurance which we will explain about. There are no exceptions made for residents applying for a visa. To confirm your place then you must go ahead and book your flight, with or without having completed your visa application. Please see FAQ section for more information on visa applications. The procedure then, is to email us your proposed dates after checking for availability and reading this whole website. We will then email you back and give you a week to book your tickets. If you don't book that week, the opportunity to book is passed on to the next interested artist. So please don't email us till you feel fairly certain this is for you. Read the whole website first. The only thing we ask of you is that you be prepared to follow the ethos of the Trelex Residencies. This means that you engage as much as possible in exchange and discussion with other poets and artists in Paris. We will put you in contact with some of the people who support this residency and ask that you be prepared to meet with them, to share you work and to show an interest in what they do. We will also ask you to help us build this network by assisting us with contacts with new people and organisations who may be willing to support residents who follow on from you. At the end of your residency, we kindly ask that you write a blog entry for our website (you can also write during your residency, if you feel like it). In it, we ask that you share with future residents some of your experiences of the residency and also a bit of your work or about your work. It sets a standard by which others decide to share about the residency and it acts as a sort of directory of alumni which we can use to put you in contact with like-minded artists who may come after you. At the residency, we also have a guest book where we hope you will leave a poem for Elizabeth Hansen to have a tangible trace of your passage and for subsequent residents to enjoy. Finally, we operate a sort of buddying system where new residents are put in contact with one or two alumni who are asked to be available to help with navigating Paris and its poetry offerings. If this sort of sharing, exchange, discussion and collaboration doesn't appeal, you probably won't be very happy on a Trelex Residency, to be honest. Trelex Residencies are based on trust. Over a hundred artists (as of mid 2016) have benefitted from the total creative freedom afforded by a residency without applications, references or other vetting procedures. With your help we can grow this network and offer more and more such opportunities to more and more wonderful artists.